Among my peers there is a growing sentiment that we are living in the end days. Or at least it feels as though things are quite bad. The sort of bad where I peer down, from my third floor flat, at the tenement houses adjacent and with envious attention survey the spots of back garden prime for Anderson shelters. Considering the end of humanity should only come once, it feels odd to be feeling this low-gut dread not for the first time. But the sensation lacks the urgency it used to have. We are all too aware of the abyss now, to the point where our eyes are starting to adjust. The young, I am told, have a stagnant obsession with twentieth century artists and thinkers. None of them seems to look forward anymore, to the atomic implants sending Facebook ads direct to their eyeballs, or to their robotic husbands and wives. Yet is it surprising when nostalgia seems to envelope further all spheres of life, both cultural and political? Postmodernism. Post Satire. Post Truth. No: post consensus. People used to think the earth was flat and still got along. And yet we can all agree things were done better in the past, but then only because the past cannot be argued with; when somebody tells us just how good it was, it isn’t around to tell us otherwise. Everything, it feels, has already happened. Or rather, perhaps what was expected to happen hasn’t happened at all. The modern, secular doomsday can only be described in terms of moderate to absolute, all-consuming dread. And always just around the corner. It’s like living a perpetual near-death experience, where everything is flashing before your eyes, all the good times, except after a while you begin to realise you are not in any of the pictures. Since forever humanity has believed it is living in times of great change – on the very cusp of some monumental transformation. Which is why there is always a certain level of urgency in futurology, as commentators try to capture those changes before they (swiftly) manifest themselves. In the twentieth century the future was by and large technological. The World Fairs of 1939 and 1964 in New York were all about technology: new cars, new trains. The 1964 expo saw the introduction of Disney’s Carousel of Progress ride. Let me repeat that: a carousel of progress. It didn’t have to make sense. Technological progress was the only progress that mattered, in any form. More technology could only be a Good Thing. But good in a way that didn’t disrupt the standing social order. Predictions of the future often tell us more about the time it was conceived in than it does about the future itself – and so, also in the early twentieth century, there were great innovations in the areas of home cleanliness and domestic appliances, but very little on how the role of the housewife might change. For that was immutable. That could never change. In the future, even robots smoked. The job of changing social attitudes was left to the arts, and subsequently innovations in the arts were always first regarded with disdain for wanting to disrupt that harmony. Impressionists were not real painters; they merely gave the impressions of being one. Camp and pop was not real art; they were materialistic and vulgar. Science fiction was not real literature. And so on. Perhaps one reason why science fiction is particularly sniffed at is because it questions the unquestionable Good Thing-ness of technology. Or it used to be. Machines are purposely built to perform tasks we cannot do ourselves, or at least do them far more efficiently. From that very premise, we are incapable of relating to them. And as they become more complex and sophisticated, going beyond being tools, our understanding of them is only further estranged. We become wary of them, even fearful. We lose the ability to control what they can do. When is it ethical for a self-driving car to kill its driver, if it meant saving somebody else? Should a robot be allowed to buy drugs online? Technology could no longer exist above the messy affairs of ethics and morality. It became, and is now, intertwined with them. At the same time this was happening, technological progress in the twentieth century also saw the greatest humbling of humanity: the moon landings. 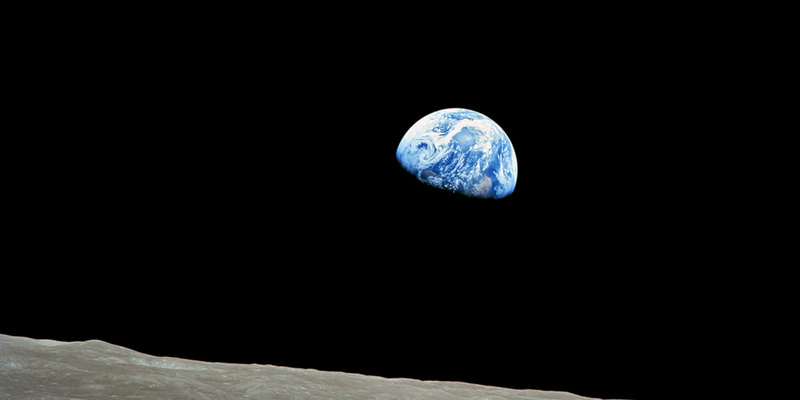 William Ander’s photograph of Earth taken on Apollo 8, Earthrise, showed the planet as a bright, glassy blue ball. Partially subsumed by darkness, a whorl of cloud obscuring the continents. It looks fragile, delicate; nobody had looked at the Earth in this way before. Suddenly, our fascination with the moon became less about the moon. Many astronauts from the Apollo programme returned to earth as environmentalists and advocates for human unity. To them our future could not exist beyond the planet; it had to include it. Our values went through a readjustment. It felt as if the world was closing in. The future became much more fragile, its boundaries now set. Postmodernism rejected all grand schemes, in technology or ideology. The end of the Cold War did not end the idea of conflict, but rather the idea of there being any alternative. The future became an inevitable trajectory, instead of a possibility for change. Perhaps, it could be said, the future has been replaced by a relentless present tense: and by losing that sense of control of what the future could offer, or what could be done with it, people no longer wanted to be part of it. It became something to prevent. Or avoid altogether. Neoliberalism has been able to position itself as an ideology of common sense. The natural fit. No-brainer. It did this the same way the future became so bleak, by losing its voice. It shed itself of the biases and reputations of the individuals who conceived it, just as the future lost the evangelical with a sandwich board. Now, for better or worse, the future belongs to nobody. It is just expected to happen, and that whatever happens is inevitable. Perhaps we are reluctant to imagine the future because, in the face of such obscene odds, it feels like deception. A piece of trickery giving the illusion of possibility when, patently, there is none. The situation is too difficult, too nuanced. Or further, to present an optimistic vision of the future feels like a hopeless distraction from dealing with the problems we face right now. A paradox in itself, because how can the present be dealt with if we cannot see beyond it? To be hopeful in a hopeless situation. To accept the impossibility of the task at hand, but striving to make it possible anyway. The paradox has always existed: only now has it become impossible to ignore. Cognitive dissonance shouldn’t be mistaken for hypocrisy. Perhaps a carousel of progress is more apt than first believed; progress as something that comes and goes, the future as a temporary state of being, with new problems to solve in the next future, rather than an endgame utopia. Most of all there needs to be a renewed sense of there being an alternative. One thing is certain: to look at the future and see nothing but an impassable end is destructive in itself. Because, in reality, we’ve always known how the world ends – the same way it starts – with you.